BLOOMING PRAIRIE, Minn., August 21, 2018 /3BL Media/ - Farmers in the Cedar River Watershed gathered last week and learned from local experts how maximizing soil health can economically benefit their operations while protecting water quality. The event was a free field day organized by a new public-private-nonprofit partnership. The Cedar River Watershed Partnership organized the event for dozens of farmers in the watershed and surrounding region at the Krell farm near Blooming Prairie, the upper part of the Cedar River Watershed. 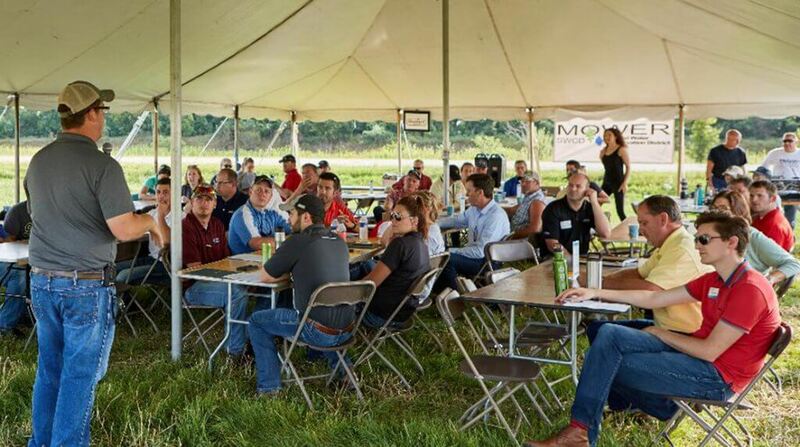 Aimed at increasing farmers’ knowledge of soil health practices, particularly tillage and cover crops, the field day focused on the costs and benefits of adopting different land-management practices that improve the soil, water and economic health of farms. Local agricultural retailer Central Farm Service (CFS) provided a field demonstration to showcase different tillage methods and the associated profitability, yield, and soil health. Keynote speakers included Bert Strayer, a cover crop expert with La Crosse Seed who shared his deep experience of integrating cover crops into a profitable farm management strategy, and Steve Lawler, a soil scientist with Mower County Soil & Water Conservation District (Mower SWCD) who demonstrated how healthy soil can help with water retention and mitigate intense rain events. At this event, the partnership shared with farmers how to increase agricultural productivity and profit while also protecting and improving local water resources through a panel discussion moderated by Hormel Foods. Partners encouraged farmers in the watershed to contact and work with partners like CFS, the Mower SWCD, and Land O’Lakes SUSTAIN to pursue information, services and resources that help them adopt practices that are the most effective and practical for their operation. Members of the Cedar River Watershed Partnership include CFS, Hormel Foods, Land O’Lakes SUSTAIN, the Minnesota Agricultural Water Quality Certification Program, the Mower SWCD, and Environmental Initiative, a nonprofit that convenes and facilitates the Cedar River Watershed Partnership. Formed in 2017, the partnership is a first of its kind collaboration in Minnesota that aims to improve water quality and farmer profitability through the implementation of precision agricultural practices and conservation. Partnership members seek to address important water-resource challenges, such as flooding and sedimentation in the Cedar River Watershed in southern Minnesota. One focus of the partnership is helping Cedar River Watershed farmers become certified through the Minnesota Agricultural Water Quality Certification Program (MAWQCP) at the Minnesota Department of Agriculture. This voluntary program rewards farmers for implementing practices that help improve water quality by offering technical and financial assistance and regulatory certainty for a 10-year period. Fifteen farmers in the Cedar River Watershed are currently certified by MAWQCP, five of them through the activities of the Cedar River Watershed Partnership. Land O’Lakes SUSTAIN, in conjunction with CFS, is the first Minnesota private sector business to assist farmers in becoming certified in MAWQCP. Together, Land O’Lakes and CFS help farmers become certified in a variety of ways, including providing education, advising growers, harnessing existing data-collection capabilities, and helping farmers identify cost-share opportunities. Convened and managed by Minnesota nonprofit Environmental Initiative, the Cedar River Watershed Partnership is a collaboration of these partners. CFS is the leading full-service agricultural cooperative in the Cedar River area and the provider of precision agriculture service Central AdvantageGS. This service, and associated product NitrateNow, helps farmers understand their soil fertility, minimize the application of crop inputs, and improve yields. This approach applies the right amount of nutrients when and where the crops need it, which increases nutrient use efficiency, reduces potential loss into the watershed, and makes sure you are not paying for inputs that aren’t needed. Data is collected, analyzed, and compiled each year to improve the accuracy and effectiveness of recommendations. Over 250,000 acres and 250 operations in southern Minnesota are enrolled in Central AdvantageGS and NitrateNow. Hormel Foods is a global branded food company. Its brands include SKIPPY®, SPAM®, Hormel® Natural Choice®, Applegate®, Justin’s®, Wholly Guacamole®, Hormel® Black Label®, Columbus® and many more. Hormel Foods has been named one of the 100 Best Corporate Citizens by Corporate Responsibility Magazine for 10 consecutive years, and focuses its sustainability initiatives on five key areas: the environment, animal welfare, products, people and communities. In addition to its goal to reduce water use at its manufacturing facilities by 10 percent by 2020, Hormel Foods has further demonstrated its commitment to protecting natural resources by joining the Ceres and World Wildlife Fund’s AgWater Challenge, developing a sustainable agriculture policy, completing a high-level water risk assessment of its largest direct suppliers and participating in the Cedar River Watershed Partnership. Land O’Lakes SUSTAIN focuses on driving on-farm improvements, protecting natural resources and helping to ensure the health and productivity of every acre, for every farmer, season after season. Based on current farming practices and business goals, our retail agronomy team partners with farmers to identify additional approaches to increase productivity and profitability potential while also improving the quality of each farm’s soil, water and air resources. Join CFS and Land O’Lakes SUSTAIN to take advantage of this farmer-owned platform for driving, capturing and sharing practical and comprehensive sustainability practices. Designed to provide growers with personalized assistance to address potential risks to water quality on a site-specific basis, MAWQCP is a voluntary opportunity to obtain technical and financial assistance in implementing farmer-selected practices. The first step is to evaluate your farm for water quality risks, working locally with certification professionals at CFS, Land O’Lakes SUSTAIN, or Mower SWCD. Farmers who implement and maintain practices that mitigate water quality risks will be certified and deemed in compliance with any new water quality regulations for 10 years from the date of certification. Farmers seeking MAWQCP-certification receive exclusive access to dedicated pools of financial assistance from state and federal conservation programs. These include a special EQIP sign-up for MAWQCP applicants that pays at a higher rate than general EQIP, and a financial assistance grant from MDA for up to $5,000 to install conservation practices and offset management expenses. Mower SWCD is focused on helping farmers understand and implement new practices and improvements that mitigate erosion, improve soil health, and address water quantity and quality problems in the Cedar River Watershed. The SWCD can help you design and incorporate soil health and water quality practices (cover crops, conservation tillage, permanent vegetative cover, etc.) into your farming operation. Technical assistance is available for farmers, and the SWCD will help you access state and federal cost-share programs for the implementation of new practices. Mower SWCD is also a local partner of the Minnesota Agricultural Water Quality Certification Program and will help you evaluate the water quality risks on your farm.